How about incorporating your favourite characters into your wedding cake topper? 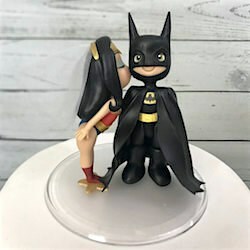 If you're into your comicbooks, superheroes, Disney, Star Wars or have a fangirl/fanboy thing going on for a particular TV or Movie character, then Play Craft can create an awesome keepsake for you. So not only will your cake look super cool on the day, but you get to take home something unique to keep forever!